This story was originally published at www.proactiveinvestors.com on February 23, 2016 and featured in The CSE Quarterly. The quote above is often wrongly attributed to Charles Darwin. But it does, I am told, summarise eloquently his seminal work ‘On The Origin of Species’. It might equally be applied, in stock market terms at least, to the junior miners that have survived the recession that has decimated the industry. Adaptability has been the watchword for Pasinex Resources (CSE:PSE), joint owner of the Pinargozu Mine in Turkey’s Adana Province. It and local partner Akmetal set out in 2012 to compile a significant zinc resource – in the order 10 million tonnes – from claims staked around the historic Horzum Mine. Pretty soon the cold harsh realities of life caught up with the companies, which luckily enough had a plan B to fall back on. This was to mine high grade direct shipping quality zinc, crush it and send it off for export. In a time where the capital markets have been shut to juniors such as Pasinex, the Pinargozu operation has provided manna from heaven – or at least a welcome source of working capital. To date 16,000 tonnes of zinc material grading around 35% have been unearthed from this carbonate replacement-style deposit. The extraction costs are currently around US$140-150 per tonne, while Pasinex and its partner receive “well in excess of US$200” a tonne for what they ship from Pinargozu. With 120 people on-site, production is ramping up from 25-30 tonnes a day to around 60 tonnes. This equates to output of around 20,000 tonnes a year. As capacity grows, so costs ought to fall. Exploration work – the company carried out 12,000 metres of drilling last year – is aimed at finding and chasing high grade veins and delineating enough ore to keep the hoppers full. “There was an old small-scale miner who went in and dug some high-grade zinc at very small tonnage,” says Pasinex chief executive Steve Williams, explaining how Pinargozu came into being. “But that was clearly an indication that there was more high-grade zinc and that proved to be the case. “We went in and started exploration and drilling. We found some very high-grade material and quickly realised there was the opportunity to get in and start mining. 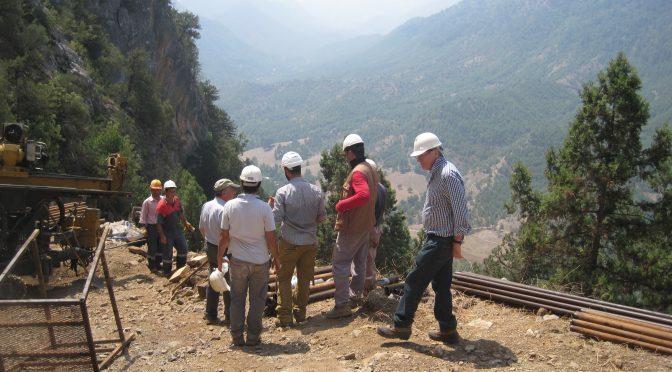 Located in the Taurus Mountains, Pinargozu is thought to be the sweet spot for a much larger zinc deposit. In fact the area, which hasn’t been extensively explored using modern techniques, is itself a small part of a belt that extends into Iran and Afghanistan. In a different world, one where the capital markets were open, share prices were buoyant and there was ready demand for new zinc projects, the Pasinex-Akmetal ground would have been comprehensively explored and its potential tested. In the current environment compiling an independent resource estimate is a waste of time and money. When the wind changes Pasinex will adapt its plan of attack, says Williams. In the meantime, it will look at methods to expand output a little further. The commodity markets haven’t been especially kind to Pasinex. The price of zinc has come down to 77 cents per pound from around US$1.10 at its height last year. Pasinex’s budgeting is done at 67 cents, which is more conservative than other operators out there. But like its rivals it is operationally geared to an uptick in the price of the metal. This could happen if the older, less economic mines continue to be shuttered. Glencore recently turn the spigots down – but then as Williams points out it could very easily push output up when the market conditions become a little more benign. Demand for zinc might start nudging up in the latter part of 2016, but don’t bet on a recovery in the mining sector this year, says the Pasinex boss. “Zinc I think will be one of the first metals to move; capacity is being removed. In Turkey foreign companies almost always take a partner. Pasinex’s Williams said he’s has had some minor differences of opinion, but the experience with Akmetal has been an “overwhelmingly positive” one. The Turkish miner has been able to interact more astutely with the politicians than a foreign company might, while it has also been active and effective on the ground with the local population. This expertise was used to good effect to fully permit and bring Pinargozu into production in about two years. Practically, Akmetal had the plant and equipment needed to mine the deposit. The country itself is caught on the fringes geographically but in the middle politically of one of the most volatile regions in the world. Millions of Syrian refugees have flooded over the border since the hostilities began, and Turkey’s major cities are on red alert after a series of bombings. But while Adana is near to the border, the mountain mine of Pinargozu remains isolated from what’s going on around it. “We are in the northern part of the province so it is business as usual and we don’t see anything,” says Williams. “But the country as a whole has been influenced by the conflict and in particular the refugee crisis. Pasinex is an oddity on any exchange – a revenue generating mining junior that is able to survive under its own steam. Is this recognised by the market? Definitely not at the moment. Neither is the long term potential of its zinc assets, or the copper property we haven’t even touched on. But this is the harsh reality of life for the likes of Pasinex. “This last three years have been very tough for us as it has for everybody,” says Williams. “I think doing what we have been doing is the right thing for this moment in time. Previous PostCSE Day Toronto – Spring 2016 – HighlightsNext PostThe CSE Quarterly – Issue 9 is Now Live!